I did this repair a few days ago now and forgot to take certain pictures but I'll document what I can. 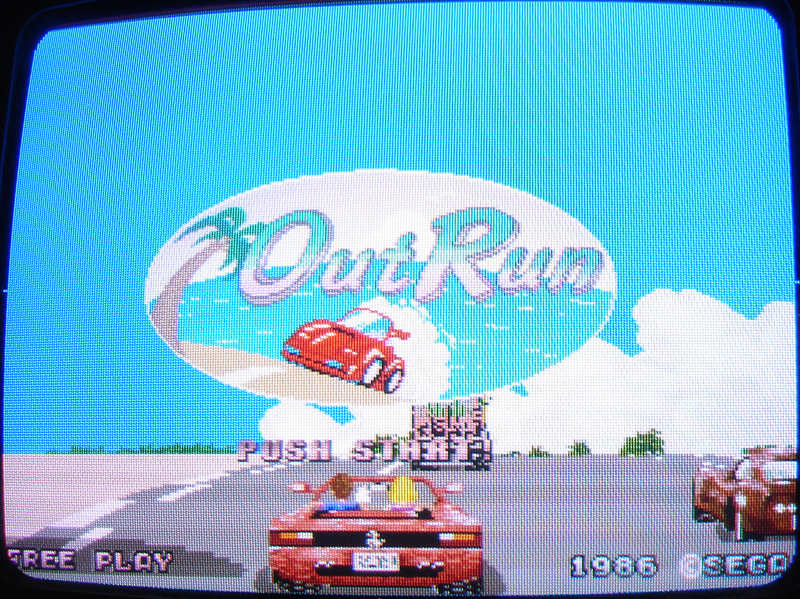 This Outrun was watchdogging (resetting) and had a smeared red and blue image on screen which I forgot to photograph. 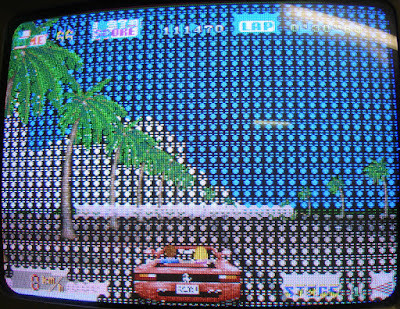 Firing it up with the extremely helpful test roms and a known working video board I could see a lot of bad rams on the CPU board, the watchdog was kicking in before the test would finish but I could see all I needed to for now. IC55 was failing every so often too so I replaced them all apart from IC114 and IC130 which are made by Fujitsu and hold up very well (unlike their TTL). Swapping back to the original video board I could just about see that both palette rams (IC92 and IC95) were failing. With these replaced I got this image. 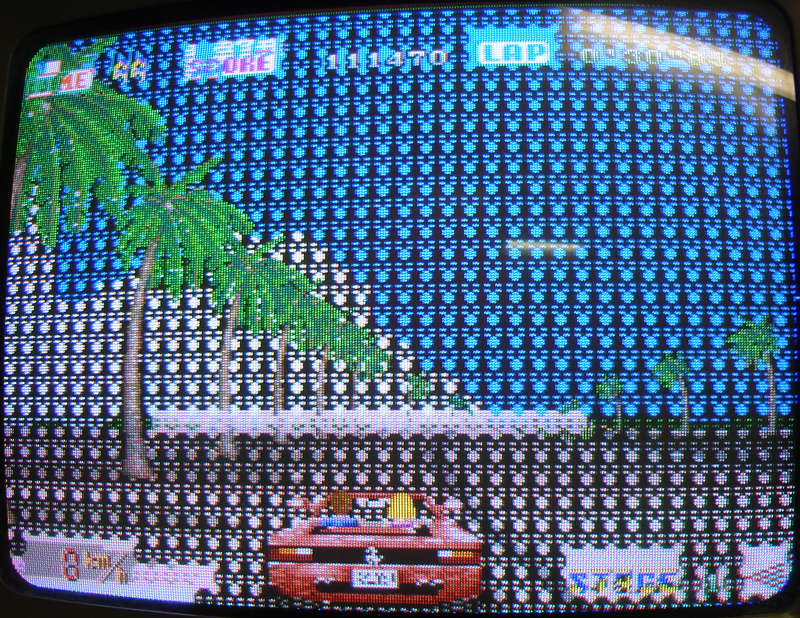 This was caused by two bad roms opr-10267 and opr-10268 if I remember correctly. With these replaced the image was perfect apart from there being no road on the left side (again I forgot to photograph this). 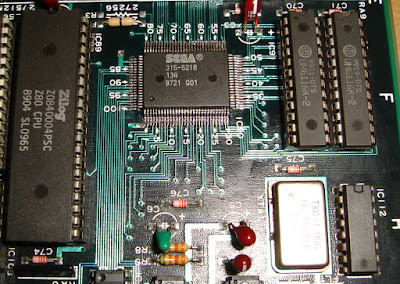 The road issue was fixed by replacing a bad rom on the top board opr-10186 at location IC47. 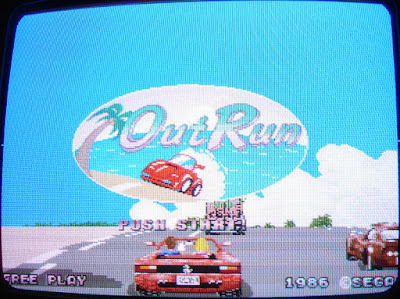 This fixed everything graphically and the controls worked too. Now the problem was the lack of sound, nothing completely quiet. 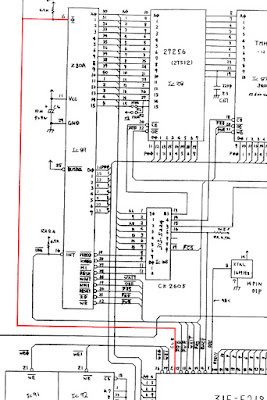 The clock signal for the Z80 was stuck. 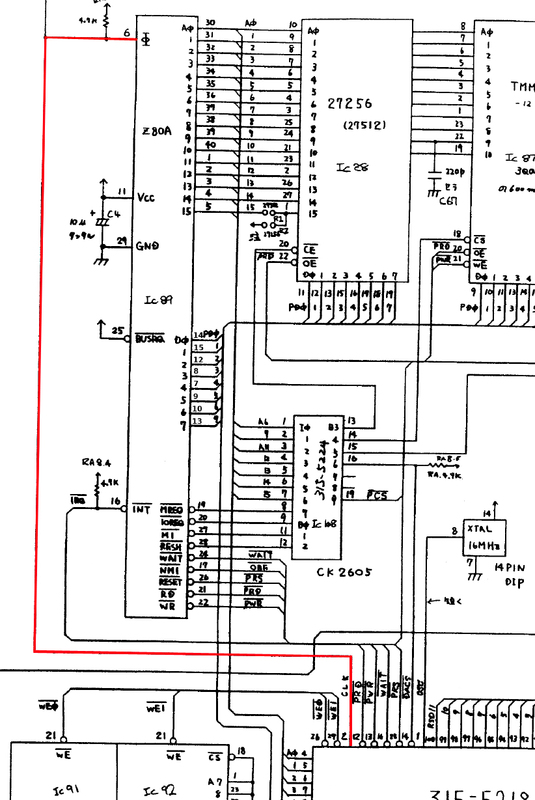 Looking at the schematics I see the last thing I want to see. That the clock is created by the 315-5218 surface mount custom chip. I tried a little experiment and created a 4mhz clock from the 16mhz clock using a 74LS74 and fed it into the Z80 to see if there was any life left in the custom but unfortunately there wasn't. Here's the custom removed and pads cleaned up ready for the donor. The new custom fitted, originally from a System X board. 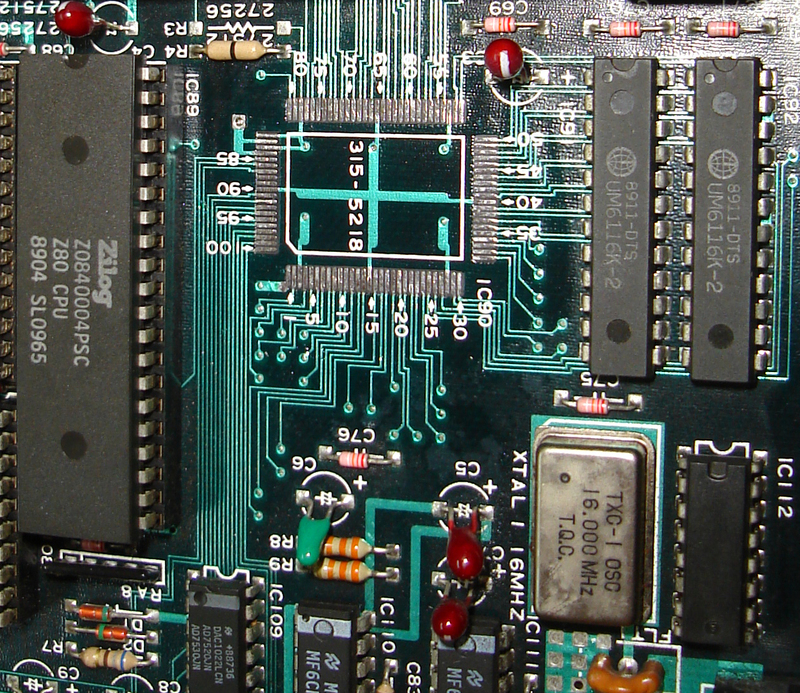 Still no sound whatsoever but the clock was back and the Z80 was a lot more active. 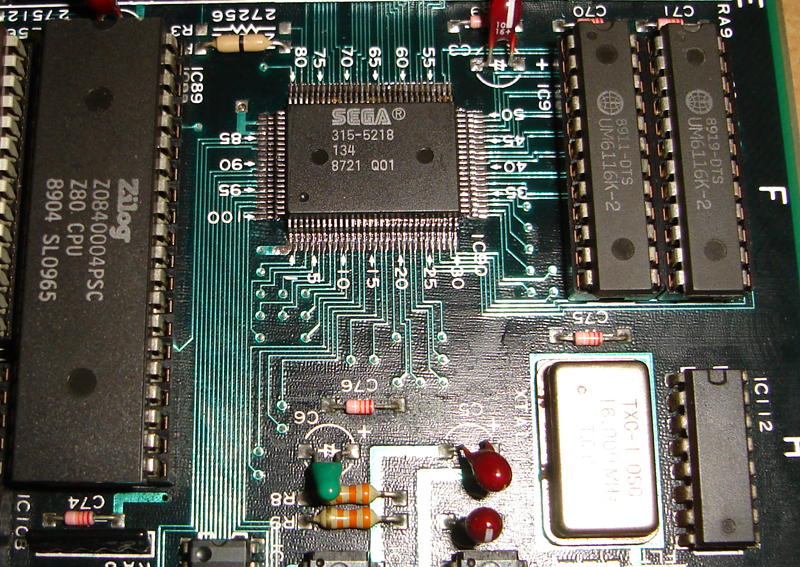 I decided to hook up the Fluke 9010a to the sound cpu (Z80) and see if the ram was good. First thing I do is a bus test and it reported A15 stuck high, this was caused by the main sound eprom epr-10187 which is interesting as the eprom programmer had no issue with it. 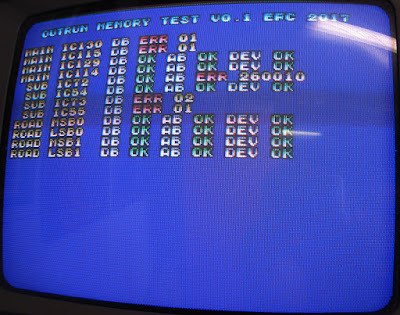 With the rom replaced there was still no sound, the fluke reported that the ram was fine so I moved onto the PCM eproms and rams. The two rams failed out of circuit testing and were replaced and the maskrom at IC70 failed and was replaced too. This finally brought back the PCM sounds that were slightly too fast and getting cut off early but finally I could hear something. 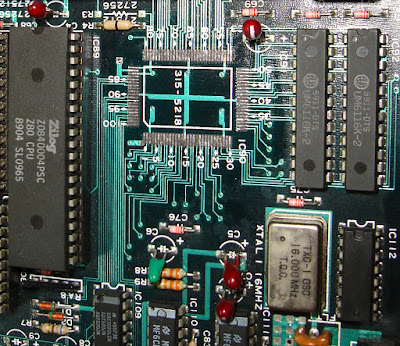 I used a sound probe on the op-amp TL084 (IC125) and nothing was going in, this traced back to the YM2151 and sure enough nothing was coming out of it. I took a replacement from a System X donor board and all sounds were back and everything is working perfectly.